If you are tired of your hectic schedule and are looking for a place in Delhi where you can just chill and relax away from the polluted environment, then you must consider visiting Ahinsa Sthal. It is one of the few places in the metropolis where you can assuredly avoid the noise of the city life and spend a few soothing hours in the midst of tranquillity. After all, who wouldn't want to take a break from their restless and furious life! So, next time you feel yourself drifting down the lanes of darkness amid a troubled life, plan a visit to Ahinsa Sthal and get all your issues solved. Read on to know more about this secluded spot of Ahinsa Sthal in Delhi and how to reach it. Being in Delhi, the region of Ahinsa Sthal experiences an extreme type of climate and hence, it is least visited during the summer season. However, for people coming to sit in its surrounding parks and meditate, it is a year-round destination. The best time to visit Ahinsa Sthal is from September to November and February to March. 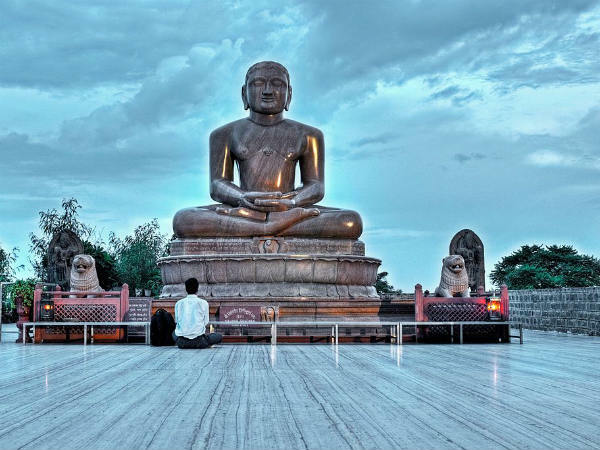 Located in the locality of Mehrauli in the South West district of Delhi at a distance of about 10 km from the city centre, Ahinsa Sthal is a beautiful Jain temple and is known for its 13-feet-tall statue of Lord Mahavir. The temple was established in the year 1980 and is known for its beautiful carvings which depict the messages of unity and equality. Even though it is a site of religious importance amongst Jain followers, it is still visited by people from all religions and communities on account of its beautiful gardens and peaceful spots, where one can easily sit for meditation and explore their inner self. Despite its location within the main city, surrounded by busy streets and polluted atmosphere, it maintains a peaceful aura and unblemished atmosphere. Literally translated as the place of non-violence, Ahinsa Sthal is known for its composed environment where you can relax amidst silence. From meditation to doing physical exercises and photography to lazing in its gardens, there is a lot to savour here. So, when you are getting such an amazing place in the midst of a metro city where everything seems dead and busy, why not visit it to explore yourself and free yourself of all the troubles and complexities in life? Wouldn't you love to do that? You can also visit the nearby lighthouse, which was built during the 19th century and is a site of historical importance. Located in Delhi, Ahinsa Sthal is easily accessible by road. If you live in another city, then you can also take a direct flight or direct train from the nearby airport or railway station respectively. Delhi is well connected to major cities by all modes of transport. The nearest metro station from Ahinsa Sthal is Saket. Once you have reached Saket, you can either take a city bus or an autorickshaw to reach it.